Well, apparently that's why they called him up at nineteen. Hey, Juan Soto is really good, guys. That probably isn’t a surprise, given his status as both a top prospect (Keith Law had him ranked #42 ahead of this season) and as a 19-year-old player worthy of playing in the majors. That’s a no-doubt blast (422 feet to the opposite field! ), the kind of swing (and pop) that can’t be faked. 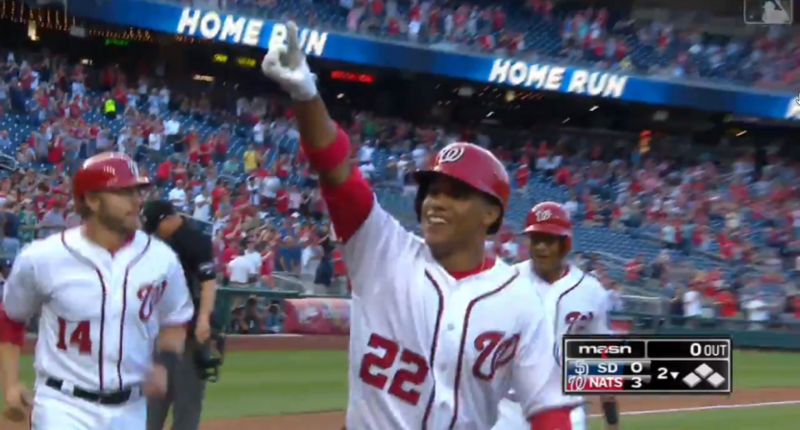 Good for him, and good for the Nationals; even if they lose Bryce Harper after this season, it’s nice to have young players like Soto to send out there for years to come.